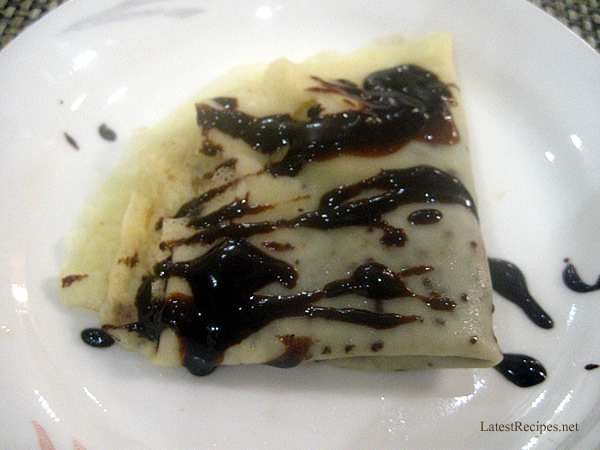 Crepes are just like pancakes…paper-thin pancakes that you fill with fresh or cooked fruit fillings inside with chocolate sauce or whipped cream..so delicious. If only it’s as easy to make as regular pancakes. 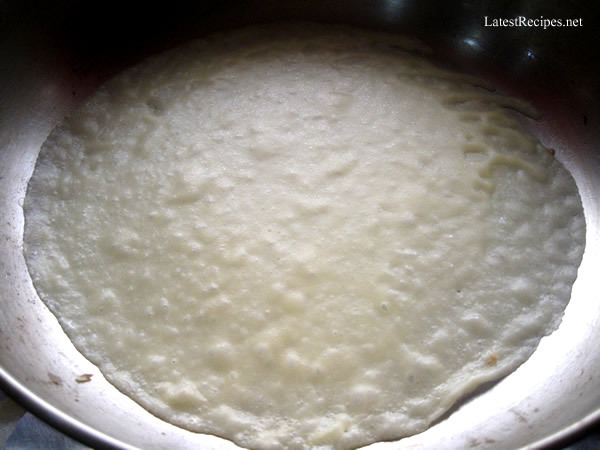 The first time I tried making crepes, it was a disaster, I wasn’t able to make a single crepe, they were all torn, the batter just sticks to the pan every time . I don’t make crepes often- only when I have a craving for it and I still don’t find it easy to make but I manage. I find that if the pan is heated right (medium fire/heat) and greased just right, the batter won’t stick to it. I use a stainless pan, the first few crepes didn’t come out right so I adjusted the fire and just used a small amount of butter to grease, a silicon brush to evenly coat the pan..plus you have to swirl the pan right away after putting the batter so it will spread evenly. In a blender, add the eggs, milk, water and melted butter; pulse for a few seconds, until liquids are combined. Add the flour, sugar and salt. Pulse for 10 seconds or so and until flour is incorporated, being sure not to over-blend. Transfer the batter to a bowl and cover. Place the batter in the refrigerator for an hour to rest. Place a crepe pan over medium-heat. Brush the skillet with a light coating of butter. Add 2 ounces of batter to the pan, swirling it around until the bottom is coated evenly. Cook until the crepe edges' pull away from the pan, about 1-2 minutes. Flip and cook on the opposite side for another 30 seconds. You may have to play with the temperature a bit. The common notion is that the first crepe goes to the pan, so don't get discouraged if you have to try a few times to get the temperature right. When you've made a few crepes, transfer them to the oven to keep them warm, while you prepare the bourbon bananas and chocolate. Melt chocolate with heavy cream in a double-broiler or make your own by placing a heat-proof bowl over a pot filled with an inch of simmering water. Once chocolate is melted set aside. In a small bowl, toss the bananas, brown sugar, rum and cinnamon together. Melt the butter in a small skillet over medium-heat. Once melted, add the bananas to the skillet and cook until bananas are softened and slightly caramelized, 3-4 minutes. 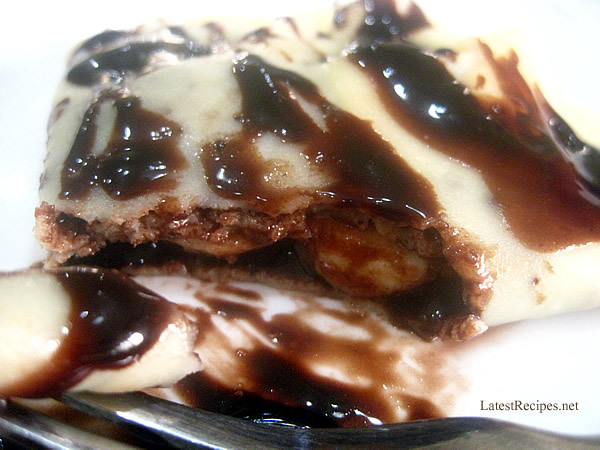 To assemble, lay a few crepes side-by-side and fill each one with the banana bourbon mixture. 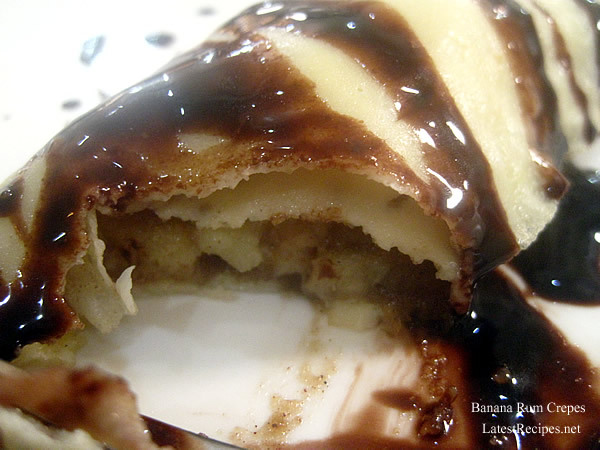 Fold each side over and drizzle with chocolate. One Response to "Banana and Chocolate Crepes"
This is about one of my favorite desserts of all time.